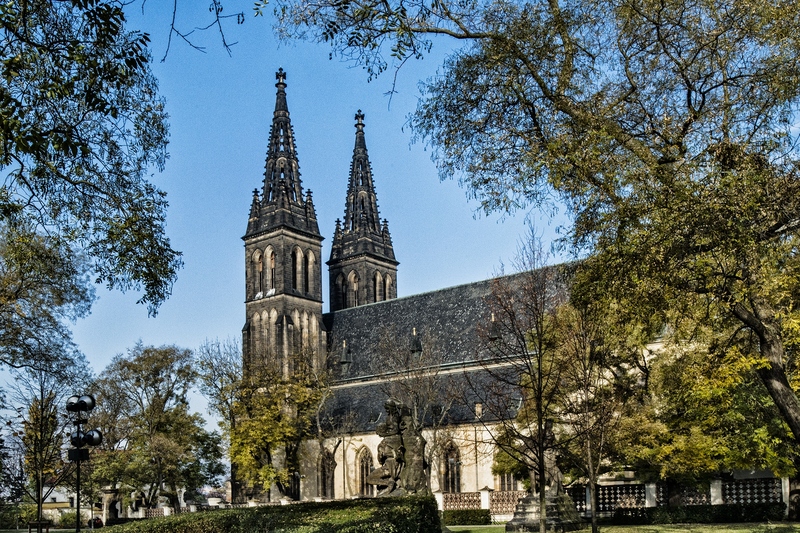 Once an hour, the Vyšehrad district is filled with the sound of bells from the chapter church, which has undergone a number of modifications in the 900 years since it was built. In 1903, its construction was finally completed, giving the church its current neo-Gothic appearance. The interior is richly decorated with Art Nouveau ornamental and figural wall paintings. The church's treasury houses an exhibition of jewellery and rare textiles from the Vyšehrad Chapter. permanent exhibition from the collections of the Vyšehrad Chapter and the National Museum (gold and silver jewelery, fragments of precious fabrics and materials, neo-Gothic objects related to the reconstruction of Vyšehrad in the late 19th century). 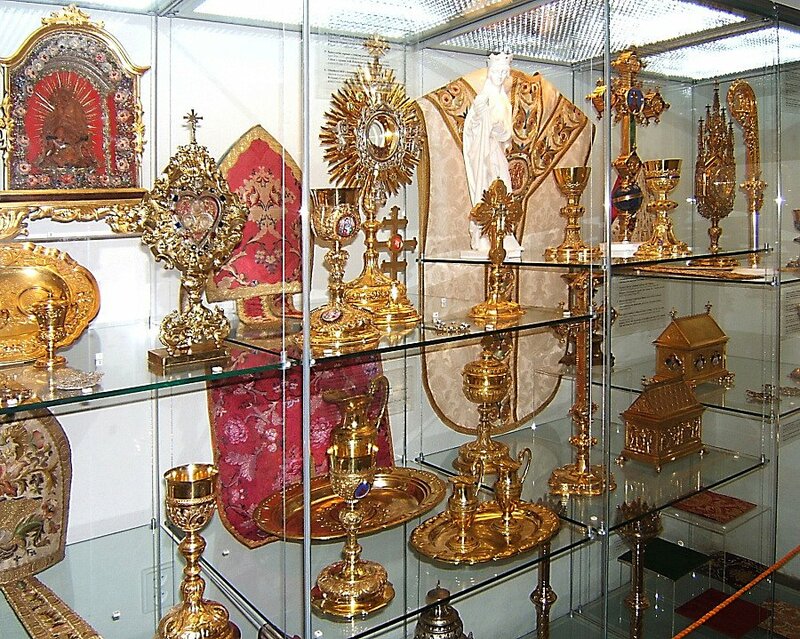 In the church´s depositary the St Valentine´s relics are kept (it is the shoulder blade, placed in a precious reliquary adorned with gold) that were supposingly brought to Prague by Charles IV from Italy. Around the 14th February the St Valentine pilgrimage combined with an exhibition of the precious reliquary takes place in the church. 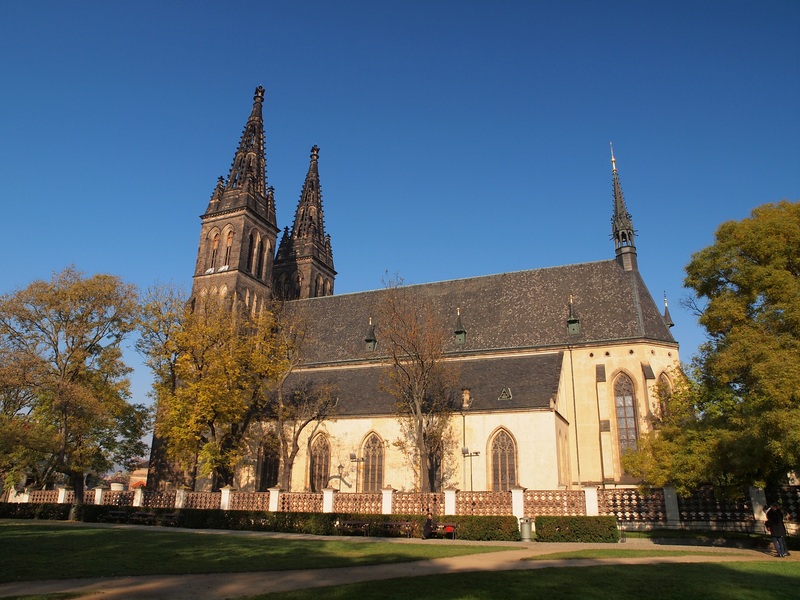 The capitulary and parish church was established by prince Vratislav II in the 2nd half of the 11th century according to the model of the Roman Church of St. Peter and Paul, when the prince began to build his seat at Vyšehrad as a purposeful opposite to Prague Castle. According to a legend, Vratislav supposedly brought 12 baskets of stones for the building’s foundations. That is also related to the founding of the canonry, which was independent on the Prague archbishop and subordinated directly to the pope in Rome. This independence was only abolished in 1763. The last reconstruction, which gave the church its present appearance, was completed in 1903. It has passed through many building eras over 900 years of its existence. From the original Romanic basilica in the 11th century, past the high-Gothic appearance in the time of Charles IV, when a three-aisle church was built with side chapels, Baroque reconstruction in the 1720s according to a project of Giovanni Santini managed by František Maxmilián Kaňka, and new-Gothic reconstruction initiated in 1885 by architect Josef Mocker. High front pseudo-Gothic towers in the front were built in 1902 - 3 according to a design of František Mikš, and at this time, Baroque bellfry from 1678 was removed. The relief of the main portal’s tympanon was carved by Štěpán Zálešák in 1901 with a theme of the Last Judgement. The temple’s interior is richly decorated by ornamental and figural secession wall paintings of academic painters František Urban and his wife Marie in 1902 - 1903. There is a preserved Baroque painting on the wall in the left side aisle, supposedly depicting Vyšehrad in 1420. In the presbytery, there are frescoes of a Vienna painter Karl Jobst with themes of the life of St. Peter and Paul. Vitrage windows were designed by František Sequens. Beautiful polychrome main altar carved according to a design of architect Josef Mocker by woodcarver Josef Hrubeš in 1884 - 1889 represents the patrons of the temple, St. Peter and Paul, and St. Cyril and Methodius. The altar of the Bohemian patrons in the second chapel on the left is a magnificent secession piece of woodcarver Jan Kastner from the early 20th century. The altar in the third chapel on the right presents the most precious desk painting of Virgin Mary of Rain, an excellent piece of Bohemian Gothic art from the mid-14th century from the collections of Charles IV and Rudolf II, donated to the Vyšehrad church in 1606 by Ondřej Hennevald. Legend says that it was painted by St. Lucas himself and that there were processions coming to the picture at the time of drought to beg for rain. In the first chapel on the right, there is Romanic stone coffin from the 12th century attributed to St. Longin, probably a coffin of a member of the Přemyslid family. A painting of Virgin Mary holding Infant Jesus in her arms was discovered here during archaeological research, dating back to the era of Charles IV. The originally Romanic crypt was built as a funeral church for its founder and the first Bohemian king Vratislav II, who was buried here first in 1092, followed by other members of the royal family. The royal crypt with the remains of the kings was, however, not found during the archaeological research. There is a memorial plaque on the church’s front commemorating the baptism of 14 Bohemian princes in Regensburg in 845. The temple’s interior went through a costly restoration in the years 1988 - 1994. In 2003, Pope John Paul II promoted the Vyšehrad capitulary temple to a papal „basilica minor“. The temple’s carillon consists of 17 bells and 4 large bells which ring separately. They can also join in the carillon. Melodies are selected differently for regular days and holidays and there are 50 songs altogether stored in the memory.